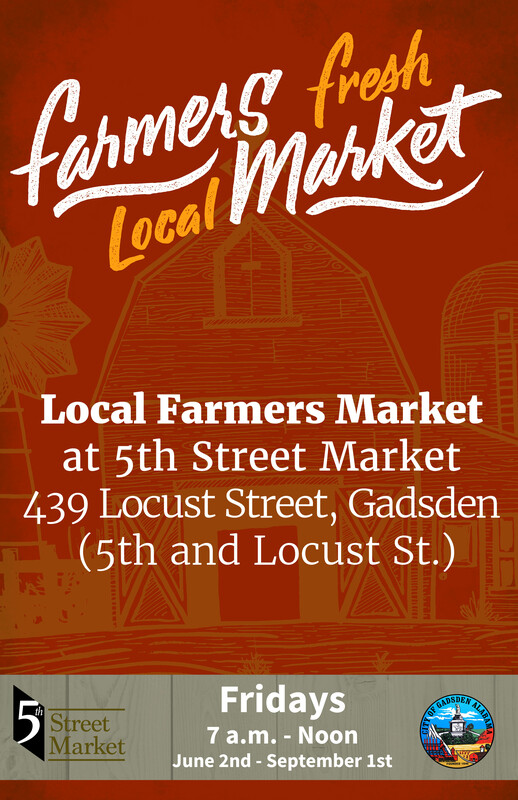 The City of Gadsden and 5th Street Market would like to invite guests and vendors back for another summer at the Local Farmers Market, beginning this Friday, June 2nd . The market will be open from 7 a.m. to Noon every Friday through the summer. After moving to its new location at the corner of 5th and Locust Streets (439 Locust Street), the 5th Street Market has undergone a series of renovations meant to improve guests’ experience. The building has been equipped with LED lighting, a heating and ventilation system, bathrooms, roll-up doors, as well as extensive updates to the exterior of the building. Only minor renovations are left and expected to be finished this summer. Another exciting change is the expanded list of vendors that are now allowed at the market. After reviewing criteria established by the Alabama Farmers Market Authority, the 5th Street Market is now open to a wider variety of vendors such as meat, eggs, dairy, crafts and other artisan-made goods! For more information on the 5th Street Market, contact the Parks and Recreation Department at (256) 549-4680. For more information or questions about becoming a vendor, email 5thstreetmarket@cityofgadsden.com or call (256) 549-4643.